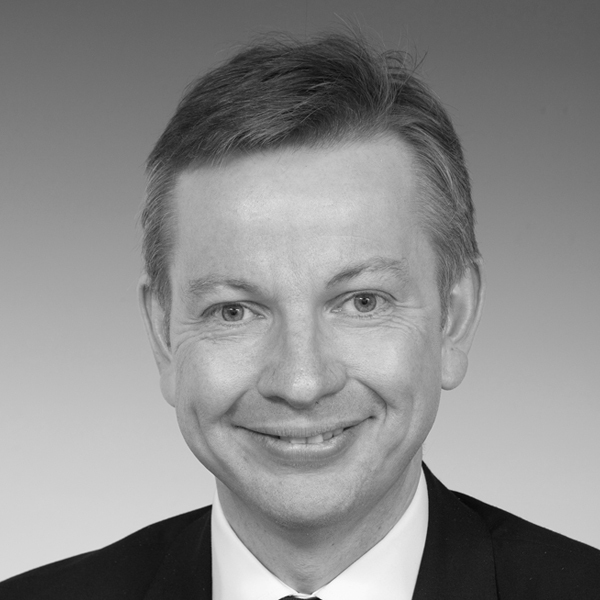 Michael Gove is Secretary of State for the Environment, Food and Rural Affairs. He was elected to Parliament in 2005 as member for Surrey Heath. In December of that year he was appointed Shadow Housing Minister and then in June 2007 as Shadow Secretary of State for Children, Schools and Families. In 2010 he was appointed Secretary of State for Education. Following the 2015 Election Michael was appointed Secretary of State for Justice and Lord Chancellor. He left the Cabinet in July 2016 and was then re-appointed to his current role in June 2017. Brought up in Aberdeen Michael was educated in the state and private sectors. After leaving university, he pursued a career in journalism, working for the Press and Journal newspaper in Aberdeen, Scottish Television, the BBC and The Times. He has written a biography of the former Defence Secretary Michael Portillo and a study of Islamist Terrorism, “Celsius 7/7”. Michael is married to Daily Mail columnist and author Sarah Vine. They have two children and live in London and Surrey.